With its stunning white sand beaches and spectacular sunsets, Longboat Key’s many beaches are among the most beautiful in Florida. Whether you seek a romantic candle-lit supper, a waterfront table, brunch or a fun family outing, the choices are many. The Intracoastal Waterway provides opportunities for wind-surfers, paddleboarders, jet skiers, boaters and fishermen to pursue their particular passions. From one day to one month stays, the Longboat Key area has an accommodation for all budgets and tastes. 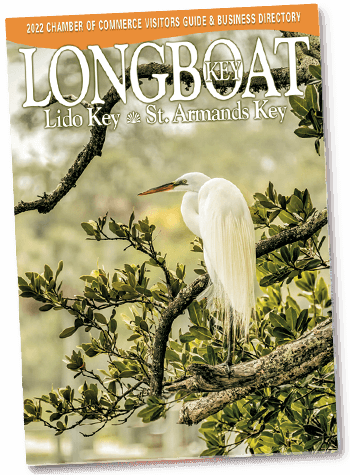 If you are seeking that perfect keepsake or unique memento, Longboat Key’s and St. Armands Circle’s specialty shops will not disappoint. The area’s idyllic weather, golden beaches and breathtaking vistas make it a memorable place to exchange your wedding vows. World-class entertainment, galleries, lush gardens, museums, aquariums, zoo, and animal sanctuaries provide hours of fun for the entire family. Longboat Key, Lido Key and St. Armands Key make up one of the West Coast of Florida’s premier areas to live, work and play!